Is this what mansplaining feels like? We’re runners. Talking about running. Tracey is explaining to me about “Parkrun” (of which I have completed 156 and am in the same running club as the guy who runs the entire thing) which is “lots of people running together”. Apparently, I can use something called “Google” to find out more. 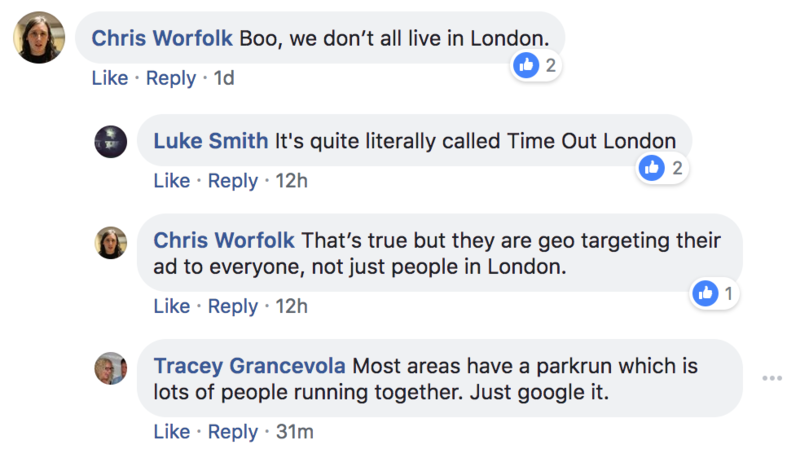 For background context: Adidas is holding some free running events, but they all take place in London, despite their ads targetting what seems to be everyone in the UK. They’re promoting it through an advertorial in Time Out London. This entry was posted on Sunday, May 27th, 2018 at 11:00 am and is filed under Life. You can follow any responses to this entry through the RSS 2.0 feed. Both comments and pings are currently closed.